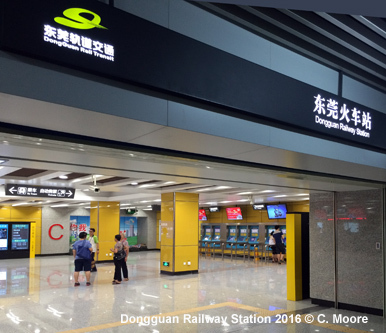 With some 8.2 million inhabitants, Dongguan is located in Guangdong province, between Guangzhou and Shenzhen. 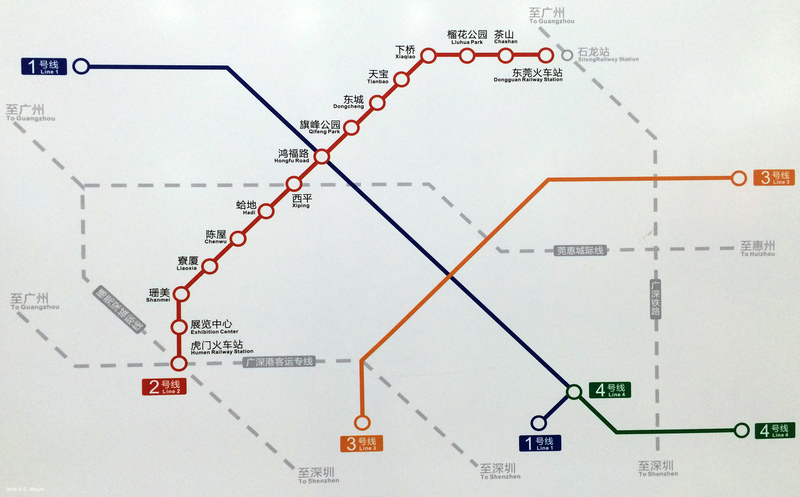 The planned rapid transit system will eventually be linked to those of the neighbouring cities, creating a continuous metro network from Hong Kong to Foshan. Dongguan forms part of a Government plan to urbanise the area between Hong Kong and Guangzhou, known as the Pearl River Delta Megacity, an area with a current population of approximately 45million. Part of the plan involves the creation of a comprehensive transport system based mainly on urban rail. 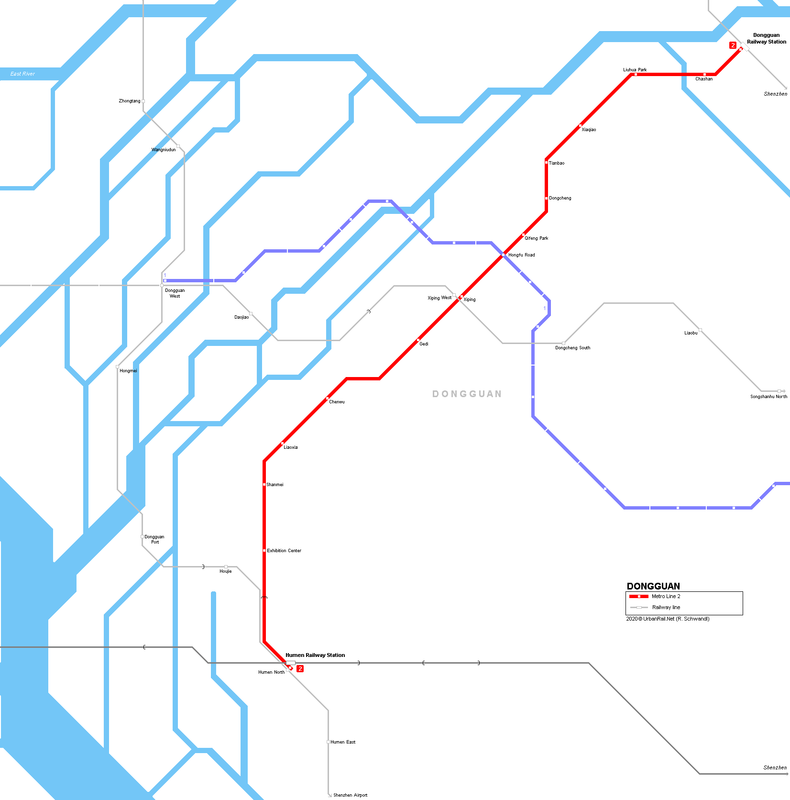 The Pearl River Delta Rapid Transit (PRDRT) has two elements, an inter-urban network and an interconnected metro network. 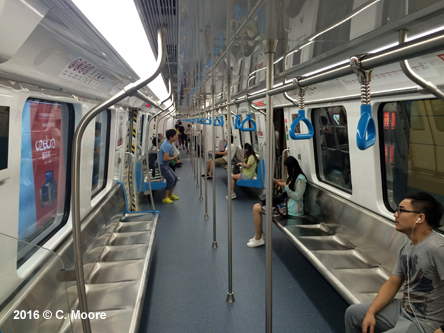 Once complete, the network will have 1,478km of service with 23 lines. 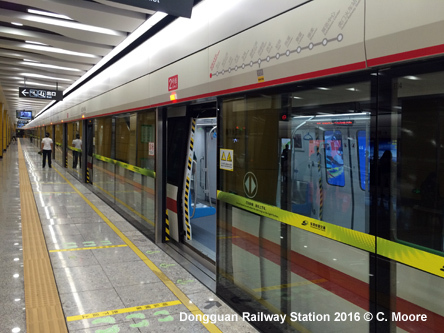 One of the main connections in this mega system is the nascent Dongguan Rail Transit. 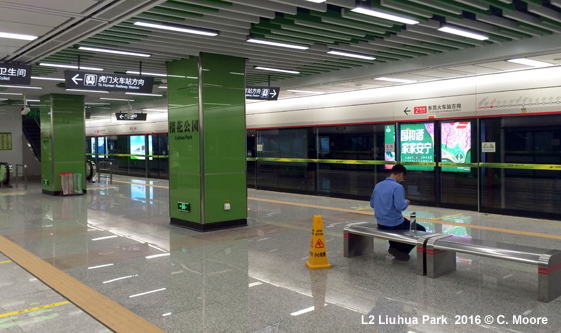 Opened last month, this is the 25th (26th if Foshan is considered different from Guangzhou) and newest addition to the Chinese Metro environment - quite a milestone and impressive given that there were only 5 systems operating in early 2003. 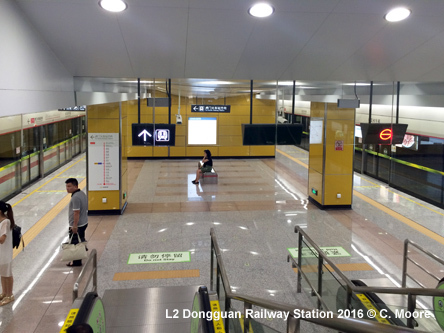 The line runs diagonally across the urban area between the two mainline stations in the city -Dongguan (Guangzhou-Shenzhen regional line) and Humen (Beijing-Guangzhou-Shenzhen-Hong Kong High Speed Line). 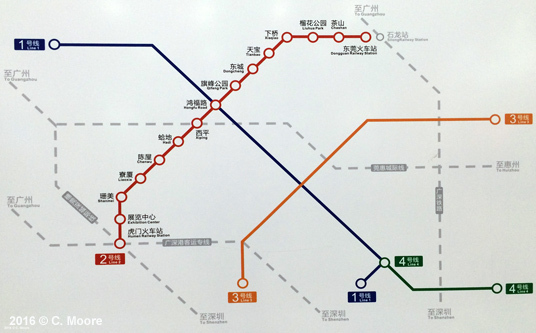 The line is 37.7km in length, housing 15 stations (14 underground) and is underground with the exception of a 3.5km section to the north of Humen Station terminus (elevated station). This elevated section runs in the centre of a main road. The line operates from 06.30-22.30 and has 9/10min base headways. 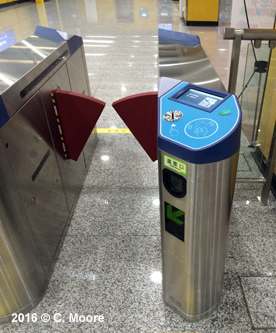 Given its newness it is no surprise that the system is smart and clean. 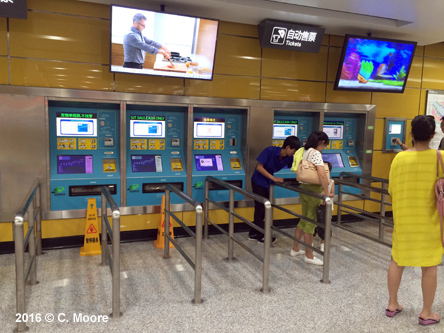 The station entrance halls have state-of-the-art electronic information boards showing expansion plans etc, modern and easy to use ticket machines providing tokens (2-8 yuan fares), station navigation maps, stylish ticket barriers and plentiful hard-copy information (in English, traditional and simplified Chinese). 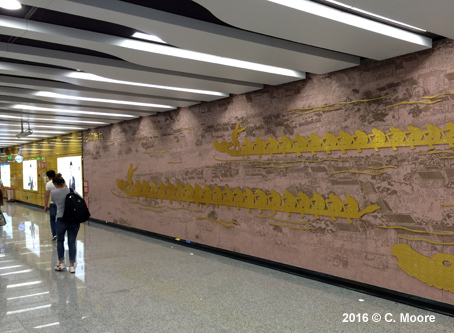 Each station has a colour theme and there are examples of art murals throughout the system. The colours are bold and give each station a distinctiveness which would otherwise be lost, given the design similarities. The colour theme continues at the platform level. These are all island platforms with full platform screens, TVs showing next three trains, seating and large schematic maps with planned lines also shown. 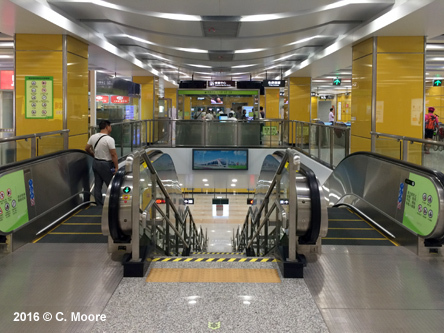 The platforms have several pairs of pillars, stairs, lifts and escalators and this means that the area appears cluttered. There are no clean lines and open views along the platform. Whilst these obstacles enable the themed colour to dominate each station, they limit platform space and don’t look very stylish. 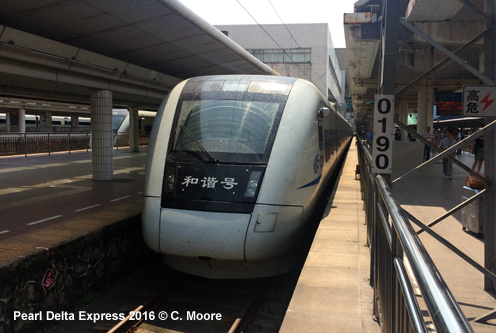 As for the trains, these are powered by overhead supply and are 6-car CSR stock made in Nanjing. Externally, the colour scheme is not very original or inspiring - a wide black band across the windows gives way to a white base, encompassing a thin red strip. The stock looks quite dated in style, and internally the standard fare continues. Stainless steel bucket seats along the sides, strip maps (in sticker form rather than electronic) above the doors and TV screens with information about the system and how to behave. 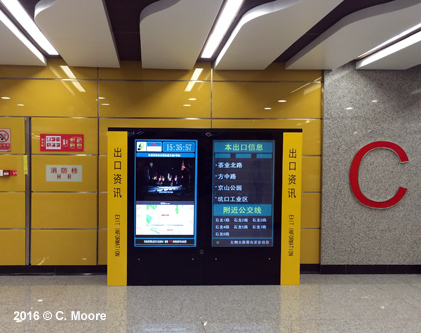 There is electronic and audio information in Mandarin, Cantonese and English. 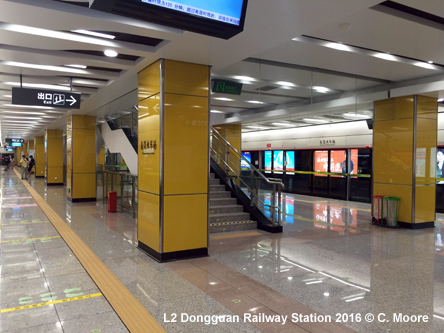 Given the high quality and style of some of the stock on recently opened lines in China, I found the Dongguan offer disappointing. The trains, though, do go at great speed – the average distance between stations is 2.5km, dwell times are efficient and the system is well used. 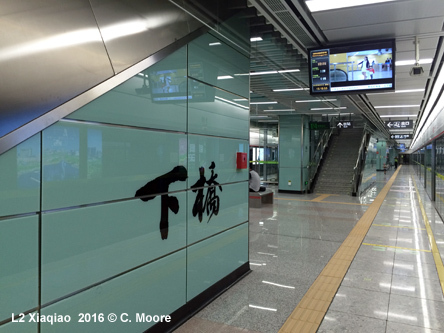 Staffing is at sensible levels and, as is the norm in provincial China, the metro staff are incredibly lovely and helpful. As a ‘stand alone’ system, this would be nothing special, but the fact that this is part of a Metro chain linking 5 cities does provide some interest.